Expectations should change with a change in environment. In a slow, wide-swinging trend, your better off waiting for a deep pullback. Don't be too quick to enter. But in a fast trend, if you hesitate you may just miss the entry. 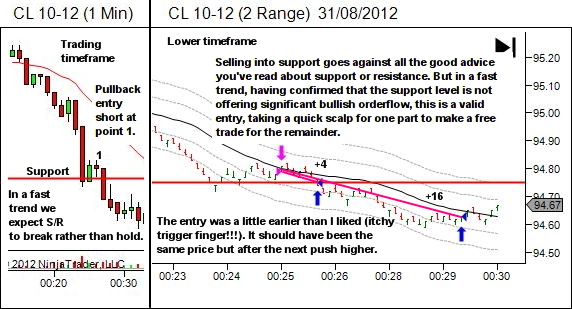 Here's two fast-trend shallow pullback entry examples. There's no waiting for a 38.2% retracement here! The shallow pullbacks are evidence of demand balancing supply; likely a mix of new longs hoping to catch a reversal and shorts covering for a profit. But on balance we are probably safe to say that there is not a lot of support (pun intended) for a potential reversal rally, otherwise we would see orderflow driving price higher. So we watch our lower timeframe for signs of potential failure of the long "lower timeframe" trades. Their failure point is our entry short, in the hope that the orderflow from this trigger will drive price far enough to again break to new lows and trigger more shorts, reigniting the trend for another strong leg down. 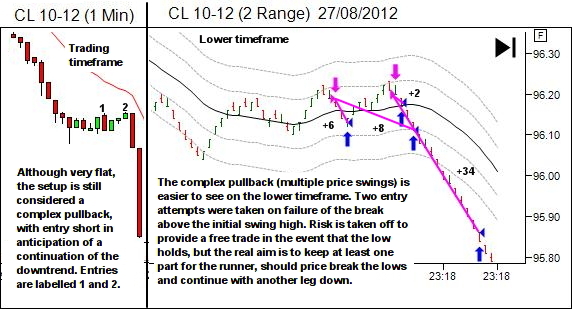 As always our trade concept remains the same… find the loser and trade against their position! And in a fast trend, the loser is almost always the guy trying to fade the trend.